The Brood TR27 20" wheelset will keep your kids rolling! 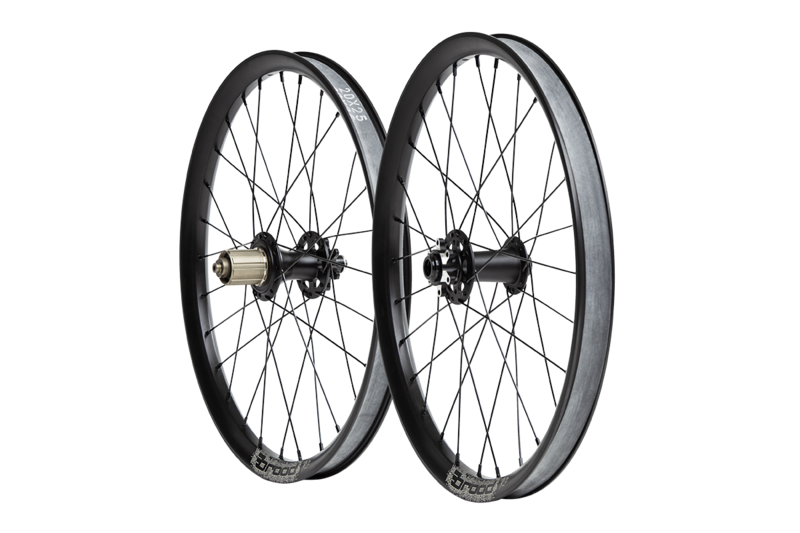 The wheels start with an awesome foundation with a 135mm wide rear hub with 5 sealed bearings and a Shimano HG compatible freehub with 5 pawls to make for tons of engagement and strength for whatever is thrown at them. The front hub is 100mm wide with 2 sealed bearings and utilizes a 15mm through axle design. 28 spokes connect the hubs to the sweet new UST tubeless compatible Brood TR27 rims. The rims are constructed out of 6061-T6 alloy with sleeved joints and 27mm internal width to keep things light, bombproof and wide. The front wheel comes in at 670g and the rear wheel weighs 835g without rim strips, but rim strips are included in case you're not going tubeless.